7.Kxh1 Qb1+ 8.Kh2 Qg1+ 9.Kxg1 Bc5+ 10.d4! The key, a movement from a competition´s game. 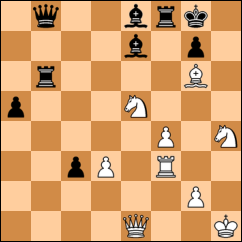 Then a variety of lines in the attack on the king, culminating in mate and in winning positions. Without a doubt a study of the pleasure for the fans of the resolution and also didactic for the exercise of the combinative game.